It increasingly seems that if Abe Shinzō is going to remain in office, he will need to retain the approval of the Japanese public, and that if he is going to retain the approval of the Japanese public, the Japanese public will need to reap some of the benefits from the purported revival of economic activity. But beyond the basic question of whether or not Japan is growing and whether the benefits of growth there are larger questions about the future of Japanese capitalism. Will Japanese companies focus more on shareholder value and profit maximization instead of protecting jobs, preserving relationships with contractors, and prioritizing bank financing over equity financing? Will individuals embrace unconventional career paths, less on-the-job training, more mid-career job changes, more control over pensions and personal investments, with the risks that all of these changes entail? Does the Japanese public believe that the pillars of Japanese capitalism should change? Of course, opinion polls can only reveal so much and suffer from flaws that undermine their validity — and public officials are free to ignore the preferences of the Japanese public in pursuit of their goals. But polls can provide hints as to how the Japanese public will respond to government policies or market developments. In a series of posts over the coming days, I will review public opinion polls dating as far back as 1993 to assess Japanese attitudes to government spending, deficits, and fiscal retrenchment; structural reform; the social security system; and saving, investment, and the financial sector. Fiscal stimulus, fiscal retrenchment, and the state: If there is one fundamental fact concerning Japanese public opinion about economic policy during the "lost decades," it's that, while recognizing the need for fiscal stimulus the Japanese people are ambivalent when it comes to how the government should pay for it. For example, in September 1993, early in the first lost decade, 80% of respondents in an Asahi poll said they wanted the government to cut income taxes as soon as possible, with only 11% in disagreement. However, when asked whether the government should issue deficit bonds to pay for tax cuts, only 23% agreed, with 55% opposed. The same ambivalence has appeared repeatedly over the past twenty years. 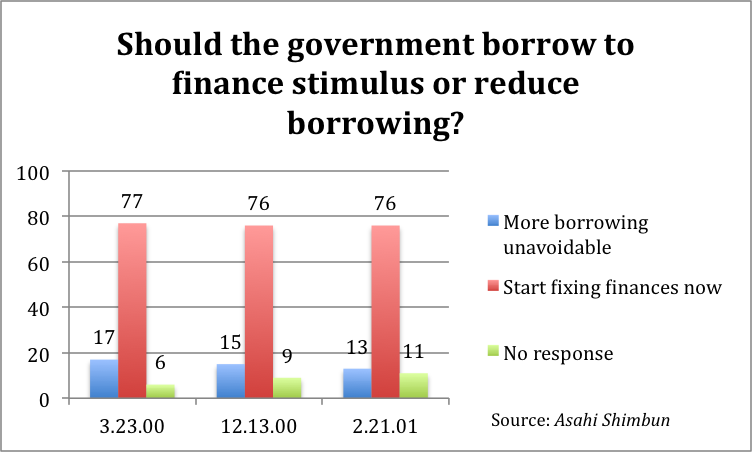 In March 2000, an Asahi poll asked whether issuing new bonds to pay for economic stimulus was “unavoidable” or whether the time was coming to reduce borrowing and fix the country’s finances: only 17% of respondents supported the former proposition, while 77% supported the latter. The percentages were roughly the same in response to that question in December 2000 and February 2001 — despite a July poll finding that 47% felt the Mori government should focus first on economic stimulus, compared to only 18% who felt it should put fiscal reconstruction first. The public was often dubious about structural reform under the Koizumi government (more on this in a bit), but was overwhelmingly supportive of structural reform when it came in the form of public spending cuts or restructuring (or privatizing) public corporations. For example, the public favored a 10% cut in public works spending in the 2002 budget, with 52% in support and only 37% opposed. When asked in December 2002 whether the government should build more roads, 64% opposed the notion with only 24% in favor. The public also went from neatly divided on postal reform to decidedly in favor of the reform that was Koizumi’s pet project. As the Aso government coped with the global financial crisis in 2008-2009, the public signalled that it favored focusing on economic growth instead of fiscal reconstruction. However, as before, the public was overwhelmingly opposed to financing stimulus through deficit bonds. An October 2008 Asahi poll found only 24% of respondents in favor of paying for stimulus with deficit bonds, compared to 56% opposed. The DPJ encountered the same ambivalence. The public once again wanted the government to focus on stimulus, but when asked in January 2010 whether they approved of the Hatoyama government's having to undertake the largest deficit bond issuance to date to cover its budget, 69% of respondents were largely or completely opposed, with only 1% giving their full approval and 35% giving partial approval. While commentators usually attribute the persistent campaign for a consumption tax increase to the ministry of finance, the public has at various times signalled its willingness to support a higher tax rate, perhaps because of long-term uneasiness about the state of the government's finances. The Japanese public may be open to the idea, but whether it supports a particular plan depends entirely on the details (the timing, the size of the increase, the state of the economy, how new revenue will be used, etc.). There is, of course, a lesson for the Abe government as it decides whether to proceed with the plan to raise the consumption tax to 8% next April and 10% in October 2015. The Japanese people remain ambivalent about government finances. In August 2012, Asahi found that 62% of respondents felt that Japan's fiscal situation is very serious, with another 32% who said it is somewhat serious. At the same time, however, 90% of respondents said that growth and jobs would be very important (53%) or somewhat important (37%) for deciding how to vote in the next general election, making it the most important issue for voters. Abe has not been exempt from the public's ambivalence. A poll in January found 49% approval for fiscal stimulus based on public works projects, but when asked whether they thought it was good that stimulus spending would be funded by deficit bonds, only 22% agreed while 65% did not. As the above data suggest, the Japanese people have indicated that they want the Japanese government to focus on economic growth and jobs, but they have consistently opposed the use of deficit spending to pay for economic stimulus. The Japanese public is not, however, opposed to the state's providing social security, economic stimulus, or support for business using public funds. Public support for the former policies is consistently strong, and regarding the last point, during Abe's first government, Asahi found 49% support for Abe's emphasis on support for businesses as part of his growth policies, with only 33% opposed. In theory, the public may also be willing to support higher taxes. A March 2010 Asahi poll asked respondents about the kind of society they wanted Japan to be. Most preferred a high tax, high welfare society: only 10% were absolutely in favor, but 55% opted for "if I had to say, high tax, high welfare." Only 23% said "if I had to say, low tax, low welfare" and only 6% were absolutely in favor of low taxes and low welfare. Similarly, when asked whether it was better to strengthen or weaken progressive taxation, 38% said it should be strengthened, with another 45% opting for "if I had to say, strengthen it." Only 13% said it should be weakened. Given that Japan's central government has consistently been at or near the bottom of the G7 countries in terms of tax revenues, there's certainly room for the government to collect more, but as with the consumption tax, whether the public will support higher taxes depends entirely on the details: which taxes are being raised, how much they're being raised by, and, most importantly, how the new revenue will be used. Perhaps the public's opposition to public works for most of the 2000s and its longstanding opposition to deficit bonds ultimately stem from skepticism about what the government promises to do resulting from seeing government after government fail to end Japan's economic stagnation. In that sense, the public's enthusiasm for Abenomics looks that much more remarkable. The next post will shift from thinking about how the Japanese public wants the government to tax and spend to thinking about what the public wants the Japanese private sector to look like, how they think companies should act, and what they think of structural reforms to change the face of Japanese capitalism.